Antalya: Mediterranean Collection's selected tours. Cirali/Chimera is the name of the village near Olympos, which was a port city established in the 2nd century and which continued to flourish until the 15th century A.D. The famous myth of Bellerophontes is said to have taken place here. The antique city is on two sides of a beautiful valley. A sandy beach is found where the town and the valley meet the sea, into which a mountain stream flows. 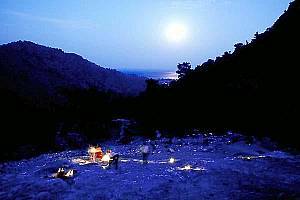 An hour's walk from Olympos brings you to the natural phenomenon of Cirali. Known by the local inhabitants as the " burning mountain " (Yanartas), it is a result of escaping natural gas, whose flames have been shooting heavenwards for centuries. It is suggested that those who wish to visit the Yanartas for the first time should be accompanied by someone from the village.